Advancing the day when humans, living and working in space, will unleash an unlimited future of opportunities for the betterment of humankind and the benefit of Earth. "Restoring Humanity's Unlimited Future through Space Settlement"
* A vibrant space presence inspires all of us that there is a future of unlimited opportunity worth striving to achieve. Your voice counts. 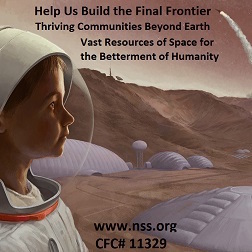 Please help us build a new frontier for all of humanity!